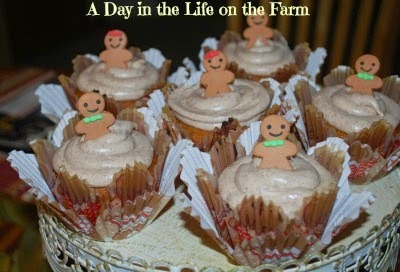 A Day in the Life on the Farm: Woohoooooooo, It's Cupcake Day!! I was invited to join in on Cupcake Day, hosted by Colleen Hill of The Redhead Baker. This is not a competition or a contest. There are no giveaways or sponsors. This is just a forum for a lot of bloggers to share a lot of cupcake recipes. The only rule was that the recipe had to be new, as in not previously published on your blog. This was an easy rule for me because this, right here, is my FIRST OFFICIAL CUPCAKE POST. That's right....I have been blogging for over a year and have never made cupcakes during that time. Muffins, cakes, cookies, tortes, puddings, trifles....but not one cupcake in over a year!!! I don't know why. Kind of boggles the mind doesn't it. So I found these cute little cupcake liners made by Wilton that has gingerbread men all over them and knew that I wanted to use them for my cupcakes. It would only make sense that if I am using gingerbread liners then I should make gingerbread cupcakes. So I did a handy, dandy little google search and found the perfect recipe on Creme de la Crumb. This was my first visit to this blog and if you are looking for desserts or cupcakes you should absolutely stop by and look at her recipe file. It is worthwhile to stop by there just to see the gorgeous photos that she has. 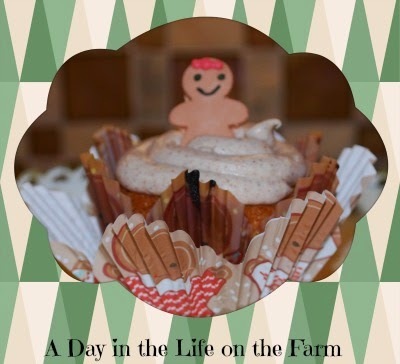 The recipe I chose to share with you today are Gingerbread Cupcakes with Cinnamon Cream Cheese Frosting that was adapted from a recipe by Martha Stewart. I followed the recipe pretty much as written, taking my usual shortcuts, and (accidentally) omitting the cinnamon in the cake batter. We did not miss the cinnamon at all. It calls for a ton of butter and no leavening agent. This is not a misprint, there is no leavening agent in these cupcakes but they rose perfectly. The frosting is very sweet, even with the cinnamon to cut it. I only used 3 cups of powdered sugar instead of 4 as called for and thinned it with 3 t. of heavy cream. It was the perfect consistency for piping and I had plenty for all of the cupcakes with quite a bit leftover, because for some reason, even though the recipe said that it created 20, I only got 12. I took these to my daughter's house along with dinner when we were going over to watch my grand-daughter so they could have some time off from house and baby duties. They were a big hit. I think they turned out just adorable!! In the large bowl of a stand mixer, fitted with the paddle attachment, cream the butter and sugars together. Add the eggs, molasses and vanilla and beat until smooth. Add the dry ingredients and mix at the lowest speed until incorporated. Increase speed to medium and beat until thoroughly mixed. Place 1/4 c. batter into paper lined cupcake tins and bake in a preheated oven at 350* for 25 minutes or until a skewer inserted in the center comes out clean. Let cool completely on a wire rack before frosting. Check out the rest of these wonderful Cupcake Recipes!! Well my daughter did. Little Miss is only 3 months old so maybe next year. awww, those liners are adorable! i love the idea of gingerbread cupcakes. yum! Oooh, lovely flavors! Gingerbread goes ever so nicely with cream cheese icing. Your cupcakes are adorable, Wendy! So cute! I love the little gingerbread men on top :) Thanks for participating! Thanks again for hosting Coleen. Yes, Eva....I liked the fact that your cupcakes did not have a ton of butter as mine did. Your cupcakes are adorable. Great for the holidays too. Oh, I love, love, love gingerbread! Thanks for sharing this. Thanks Cam, hard to believe this was my first cupcake post. Your (about) story is fascinating, Wendy...And your gingerbread cupcakes are perfect for the season =) I'm intrigued by the 3 cups instead of 4 cups still making its way into a nicely piped buttercream. Many thanks for the recipes. Thanks. I appreciate your taking the time to read my about page. Those cupcakes are really adorable!! omigosh those little guys are so cute! I was happy with how they turned out. Those are soooo cute! How interesting that there's no baking powder! Yes, I am glad that they put into the original recipe that it was not an oversight. Yum! Cinnamon cream cheese frosting sounds incredible! I am not a frosting person Kathleen but everyone else loved it. I just want to squeeze the cheeks off those little gingerbread men! ;) Adorable cupcakes.